In honor of Memorial Day, I chose the song “Mr. Red White & Blue” by Coffey Anderson. This song is a great example of what Memorial Day is all about. I hope you all have a great day with your family and friends, and thank you to all that have served, are serving, and have taken the ultimate risk for the love of our country. 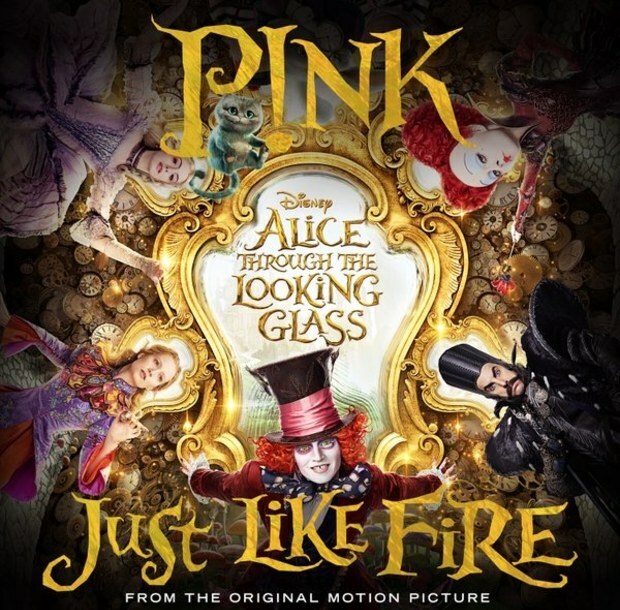 P!nk is back with a new song for the new Disney movie “Alice Through the Looking Glass”, the second installment of the Alice in Wonderland movies called Just Like Fire. P!nk is known to be amazingly creative in the videos for her music, and this video is no exception. The video appropriately has an Alice in Wonderland theme to it. Her husband Carey Hart, as well as her daughter Willow, also star in the music video. I have always enjoyed P!nk’s music. She also had a no filter, “I don’t care what other peoples opinions are about me” attitude and exudes a confidence that I look up to. This song is about wanting to have instant gratification of something, whether it be the dream that you have always wanted for your life, or something else important, and then realizing that there is a better way of going about it. When we want instant gratification, we end up opening the door for being hurt and dealing with shady people and putting ourselves in situations that aren’t always the best and this can change us as people. Instead of doing it the way other people want us to, we need to focus on what our thoughts and ideas are, and once we do that we can set a fire under ourselves and plan. Who knows maybe we will change the world one day. If that makes us crazy, so what? 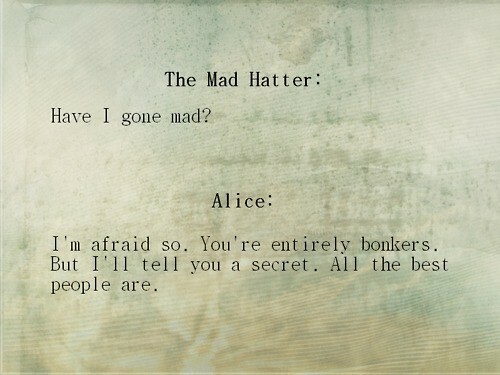 I mean it was this conversation between Alice and The Mad Hatter that speaks all the truth in the world. All the best people have gone mad at least once or twice. Music Monday is back! Sorry that it has been gone for a while. I didn’t have a chance to post anything because school and homework took over my life for a while there. Back to the music! This week, the music world as well as many music lovers lost a legend. The artist known as Prince was found dead in an elevator. No one knows how he passed yet, but a week before his passing he checked into a hospital in Illinois because he had been dealing with the flu for many weeks prior. I chose the song When Doves Cry because I think it is safe to say that doves there were many doves crying this week after his passing. If for some weird reason you do not know who Prince is, he is a singer, songwriter, actor, plays all the musical instruments, and his genres of music range from funk, R&B, rock, soul, and pop. He was the main character (The Kid), in the 1984 movie “Purple Rain,” and wrote all the music for the movie including When Doves Cry, as well as the song Purple Rain, based off the movie. He was a very spiritual and private person, and lived out of the spotlight most of the time. He was born in Minneapolis, where he stayed his entire life and career. I have never really been a Prince fan until a few years back. I heard his music growing up, but never really got into it because it was not the type of music I listened to. However, over the past few years, my musical taste has grown and I have grown to love and respect his music. I love how Prince always made the music about the music only and not all the politics surrounding the music and the business. Like I said, the world lost a legend this week and the music world has a huge gaping hole that will never be filled again. Rest in Purple, Prince! I hope you are up in Heaven rocking out with all the other great musicians that we have lost over time! This week I decided to share a song that, in my opinion, tells and shows how the entertainment industry can be. That song is “La La Land” by Jax. If you have never heard of Jax, you are probably living under a rock. Seriously though, she came in third place on last seasons American Idol. Coming from New Jersey, she wowed the judges with her rendition of “I Want to Hold Your Hand” by the Beatles. To no one’s surprise, the judge’s loved her and she headed on her way to Hollywood. She seemed to breeze through every week on Idol thanks to amazing performances, as well as her fans, better known as the JaxPack. Jax wrote this catchy pop song about her time on the show and with the message that “everything ain’t always what it seems.” While the show is a great thing to be on and has great exposure, it also comes with it’s negative pressures as well. I agree with everything Jax sings about in this video. The industry is not all glitz and glam. Honestly, there is actually a lot more pressures that come with being in this business. It can be very stressful and cause a lot of different emotions all at the same time. When you read or see something that claims to be true in an article, my advice is to take everything you see with a grain of salt because everything may just not be as it seems. This is why I have said, and will forever say, that this business is not for the faint of heart. So enjoy this song and I dare you not to get it stuck in your head. Speaking of American Idol, if you live in the U.S. be sure to watch this Thursday, yours truly will be in the audience. Twenty-One Pilots are a band that I just recently heard about after this song started playing on the radio. They have actually been around for about 5 years. The band, which consists of Tyler Joseph and Josh Dun, hail from Columbus, Ohio. “Stressed Out” is their third single off of their album “Blurryface.” To me, their sound is unique. A mix of hip hop, mixed with alternative with a pop feel. You might be wondering why blurryface and what does it mean? Trust me, I was wondering the same thing too. Well, according to this interview here, blurryface represents the insecurities that the lead singer feels. Honestly, I think this represents people in my generation. I believe that a lot of people my age have the same insecurities. I will be the first person to tell you that I also suffer from these types of insecurities. Being an adult is overrated. I wish that I could go back to childhood where there was not a worry in the world. I wish I could go back to the day where it didn’t matter what I wore, what I looked like, and back to the day where I didn’t need to worry about job hunting or paying bills. When I was growing up I was always greeted with, “Go for your dreams!” “Don’t let anyone tell you that you can’t accomplish your dream!” Is it just me, or was it the previous generations that taught us this powerful lesson? However, if we do that, we are labeled as rude and disrespectful as well as greedy and lazy. See the problem here? This is just an idea, but maybe our dreams look different then people in previous generations. Nothing is wrong with that. Different dreams include different ways of achieving them. That’s just my two cents. What about you? Do you agree? Disagree? Why? This song really speaks to me and about my life here in Los Angeles and being in the music industry. Like I have said about a thousand times before, living here in LA and being in the music industry is not easy for anyone, let alone being disabled and pursuing a life in the music industry. It takes a very strong willed person to keep pursing and fighting every day. My dad came to visit me a few weeks ago and he finally got a glimpse of what my life is like here in good ol’ Hollywood. I was excited to see him, and am very happy that I got to spend some time with him. I know my dad loves me unconditionally and supports me in anything that I want to do with my life, but I sometimes feel like he doesn’t understand why I decided to move all the way to LA to pursue a job that probably has the most unstable job market out there. Yes, it is not the most stable job environment, but it keeps me on the edge of my seat most days. But want to know something? I wouldn’t have it any other way. For example, a wise person once said that if there is something else that you are good at, and pursuing music isn’t your only option, go do that because the music industry is no cake walk. I have never been one to settle down with a 9 to 5 job. To me that is way to boring. I want excitement. I want something new to happen every day. This is why I am pursing a certificate at UCLA in their Music Business program. This is why I go to tapings and concerts and network with people from all around. I am learning every day, and yes, there are days where I have no idea what the hell I am doing, but it’s all a learning experience. This is why I always ask people to trust me. Music has always been a huge part of my life. I mean, I wouldn’t live in the entertainment capital of the world if it wasn’t, so I’m going to start doing something new every Monday. I am going to share a song or music video that I love at that moment. So without further ado. I introduce to you Rayvon Owen and his music video for his new single “Can’t Fight It.” (see below for video). Rayvon has come a long way since his stint on American Idol (where he was in the top 5), musically and personally. You see, not only did he release his music video today, he also used that platform to say that he identifies as a gay man. In the song he sings about how there are those moments where you just cannot fight the feelings that you have for people and that is where learning to trust and surrender to those feelings comes into play. I have had the honor to meet him during his stint during American Idol, and have seen him numerous times after Idol ended and I cannot express how proud of him I am. He is quite possibly the sweetest guy on the planet as well as humble. When it comes to his music he is a hard worker and is very passionate about his craft. I can safely say that while yes, I am a fan of him and his music, I consider him a friend as well. With the platform that he has, he will make a huge difference in the LGBTQ community as well as the music industry. Please check out the interview that he did with Billboard here.